Whether you’re seeking zucchini squash from May to November or asparagus from February to June, you’ll find what you’re looking for at Acquistapace’s, which has one of the best seasonal produce selections available in Covington, Louisiana. We carry plenty of produce options to cover all of your needs whenever you visit our store. To provide our customers with a nearly unlimited selection of seasonal fresh produce, we carry vegetables and fruits grown all over the world, along with local Louisiana-grown options. Our produce options will change from season to season to guarantee freshness whenever you visit us. We work to maintain a consistent level of quality across all our offerings, and produce is no exception. In an effort to ensure our produce leaves our customers satisfied, we always offer fruits and vegetables of the highest quality. You’ll see a difference when you shop at Acquistapace’s. With freshness guaranteed at all times, our customers are never disappointed with our selection. We have plenty of options in stock every day to keep you coming back. 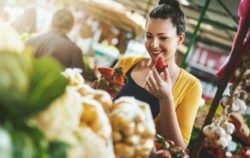 If you’re looking for a local market that can serve as your premier source for fresh produce, pay a visit to Acquistapace’s Covington Supermarket located at 125 E. 21st Ave. in the heart of downtown Covington. You also can visit our Mandeville location at the intersection of East Causeway Approach and North Causeway Boulevard, where you’ll find our selection of fine cheeses, spirits, and wine to help you prepare for your next big gathering. You can contact us today if you have any questions about our offerings or locations.